Car parts are different from one car to another, even for the ones with the same model and manufacture/registration year. To identify the right parts for your car, we need the "Model Code" and the "Chassis Number" that are written on the ID plate of the vehicle. Model Code (or Number) for each models. And it is same for each models. 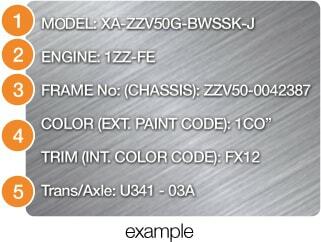 Chassis Number (or VIN Code) is provided for each vehicles but it is different from each other even with the same model. You can find these information below on the ID plate of your car. 4. Color Code and Trim Code: They are required for color matching when ordering body parts. The ID plate is usually located on the firewall in the engine compartment or on the center pillar. Also you can find the Chassis Number (VIN Code) on the locations below. For TRUCKS they are usually located on the chassis frame.